"The poem entitled Halloween is one of the most amusing in the author's whole collection. It contains a full and accurate account of various spells which, on the eve of All Saints, when the devil is thought to be let loose, the youthful peasants in Scotland were wont to employ, in order to discover the form, name, and fortune, of their future husbands and wives. These superstitious follies, of which the origin is not accurately known, are going so fast into desuetude, that they would soon have been entirely forgotten, had not Burns preserved the remembrance of them in this charming poem. 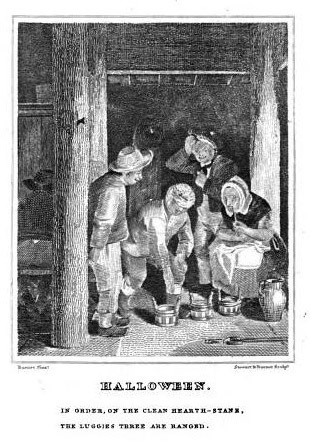 It has been observed, that in Halloween we have the interior of a Scottish peasant's cottage, with all its appropriate manners and customs, at the season of merry-making..."
"Another of these spells is performed in the following manner. Three dishes are ranged on the hearth, of which one has in it clean water, another dirty water, and the third is left empty. The person who is to try his fortune is blindfolded, led to the hearth, and desired to dip his left hand into one of the dishes. If it chance to he put into the clean water, the future husband or wife will come to the bed of matrimony a maid; if into the dirty water, a widow, or something worse; and if into the empty dish, the person making the experiment will not be married at all. This is repeated three times, the arrangement of the dishes being altered each time." To see them duly chang’d.